We've been 8 times all told, including NY and Washington DC, but all in August ( wife works in a school), so never experienced the winter over there, so it's always been in the 90s. Did have a tropical storm once, it was named as "Gustav" if I remember rightly, it was one category below a hurricane, and that was scary, so those poor people in Texas must be going through hell, and I see there is another hurricane on its way, looks to be heading towards Florida by end of this week, glad I'm home! Well, just back from the BMW garage (Paddock motors, Exeter), they plugged it in, ran a diagnostic, and......nothing! It's all ok, no fault codes, no leaks, the engine is running perfectly OK. They cleared and reset the adaption values, and was told to see how it goes.its a 30 odd mile trip back home, mostly motorway and dual carriageway, all ok, till the final hill to my house, and it started to pink. I am at a loss ( and £78 lighter)! What brand/octane rating fuel are you running? My previous z3 was fussy about fuel and,like my present one is only happy on super plus 97 rated fuel. The last car would pink for one or two firing strokes before the knock sensors picked it up and the ECU would retard the ignition map which would always occur if using supermarket/regular pump 95 unleaded. I learned a lot about fuels when driving my BDA engine Westfield with 12:1 CR. In 55,000 miles,my current car has run exclusively on 97 super plus grade fuel from companies like Shell,BP and Texaco.I avoid cheap fuel and 95 like the plague. Rewind time 18 years to 1999-no Ethanol was blended into petrol by refineries,BMW wrote the ignition maps presuming 97 octane fuel and state this to be required in the owners handbook.Fast forward 18 years and we now have to accept 10% by volume of Ethanol in petrol. This has been done in stages and in some countries in the developed world,15% is becoming the norm. You do not,as far as I see,mention grade or brands of fuel used. I realise that some people may happily run 95 octane unleaded,however,these owners may be lucky/have the sound system on/be a little hard of hearing? Maybe time to run a few tankfulls of 97 superplus if not already doing so,cheaper than non conclusive diagnostic bills. Just found post 15 mention of fuel used is 97-have you tried all brands? Not convinced this is Piezo knock sensors or glowing carbon deposits. The only non-supermarket fuel in Tiverton is Esso, and I always use the highest octane petrol available, which I think is 93, so I will have to find either a Shell or Texaco garage (Exeter), and fill it up with 97, that is the only thing I haven't done, as I assumed the ignition would adjust to suit to stop pre-ignition at the expense of (slightly) lower performance. Sorry for the double post,problem is,it is doubtful that BMW ever expected their engines to have no choice but to run on today's dire and highly varying fuel so possibly even when fully retarded,the spark is still lighting up the mixture early. 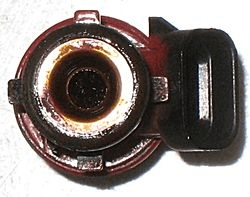 Another thought,I had my head refaced when changing the 18 year old gasket and rebuilding the cooling system,about 0.3mm was removed and this would slightly raise compression-again,an event not factored in by BMW when mapping the ignition curves. Unless you had your car from new,would you know whether or not the CR has been raised as a consequence of a head gasket change etc ? We are not alone here,a friend who runs a Jag V12 has pre-ignition issues for a number of reasons and fuel is the main reason. Well, I have a qtr tank of fuel left, couple more trips to work, then I will fill it with 97. Question: Do ALL BP/Shell/Texaco garages sell 97, or will I have to drive around? Just back from Texaco where they have reduced down to just one 97 super plus pump,expect they all have them. Can't comment on Tiverton but was in Croyde in August and bought superplus on the Braunton road without problem. You shouldn't have a problem from forecourts selling the brands discussed. You may find an immediate difference or possibly it may take a tank or two of 97 for the adaption to set in the ECU. FWIW,these engines have very tough hard valve seats so the most damage possible is a little valve face pitting as long as the car is not merrily pinking through the gears and every hill. Yes,I am finding all this lowering of hydrocarbon content in fuel a bit curious,don't get me wrong-I am all for the planet and want to do my share to mitigate atmospheric pollution.The motorcyclists and classic owners are tearing hair out as fuel systems collapse since Ethanol introduction. 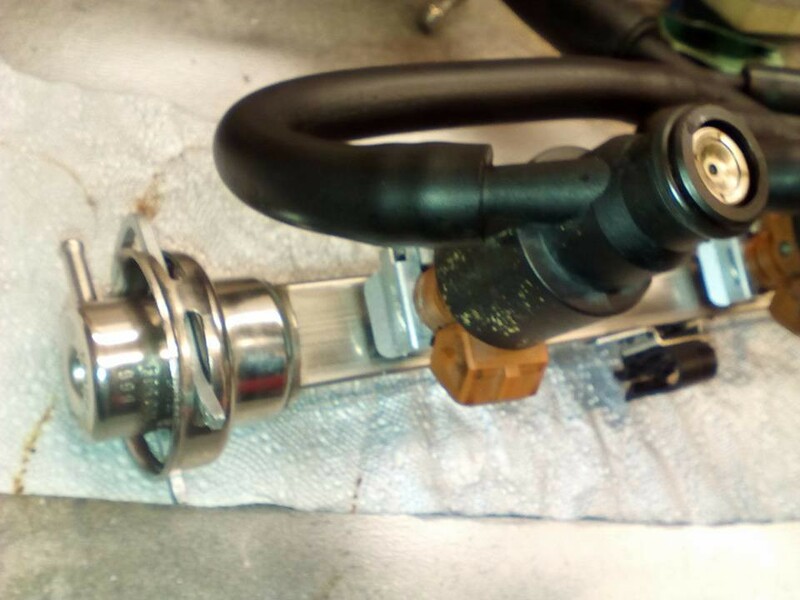 Handsome ,interesting to see your injectors and the state they were in,I believe this is down to: Ethanol + heatsoak following a drive and also inlet valve to each respective inlet port being open for its equal share when stopped.Wish I had got pics of my injectors after 112k miles when manifold was off last week for other access-they looked like your after pictures but without the clean. 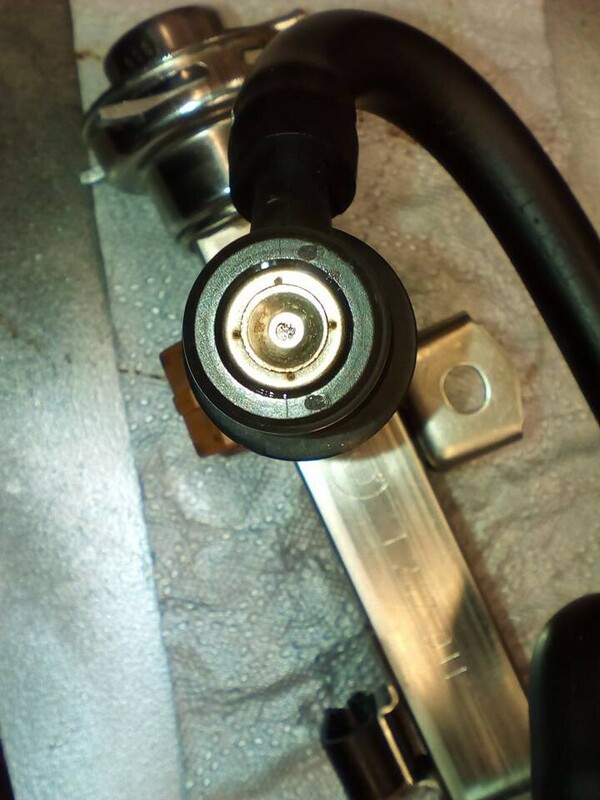 I have read and heard many positive outcomes from cleaning gummy injectors ultrasonically in a way that fuel additive cannot achieve.I wonder if my clean injectors was down to exclusive super plus use? Thanks for photos,very thought provoking. My bike has suffered from the higher content of Ethanol, it has a plastic tank (Moto Guzzi, 12 years old), the tank developed a pin prick hole, the plastic had melted!...temp fixed for now with tiger seal, but will need a custom Aluminium tank in the future, because it will happen again, unless I seal it, which is a pain. Not wishing to stray away from pinking and knock sensors etc,bikes have been badly affected,my son's Kawasaki tank leaked and his friend had leaks everywhere on a suzuki, brit classics such as TR6 and jaguars also fared badly owing to this, to mention just two makes. 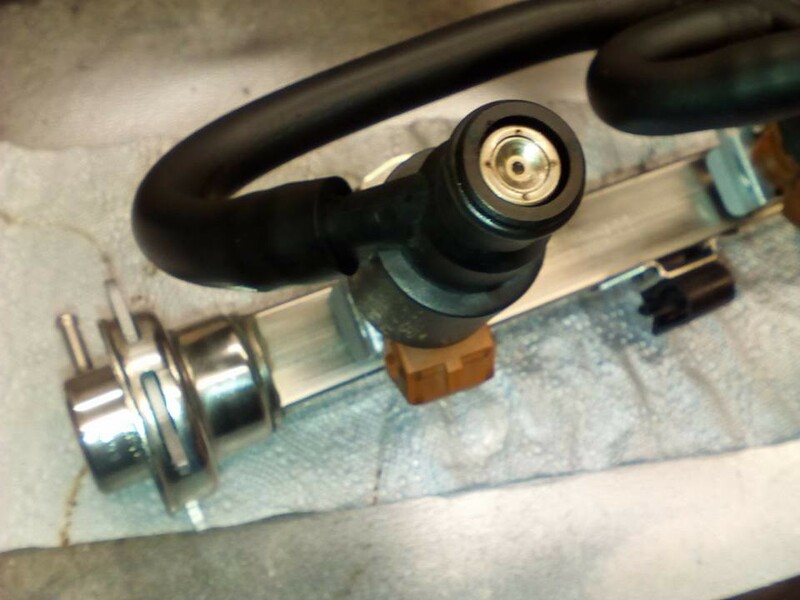 On bikes as you found,plastic tanks are vulnerable,also rubber float bowl seals and any "rubber" parts like inlet stubs downstream of carbs. at the bottom and all over externally and would split in a low speed accident. I wouldn't use that shower where you took your car to be hooked up to their diagnostics. All the gear, no idea. Did the same to me, charged me for new MAF and then my car broke down instantly with same issue and they wanted to charge me to recover it after their work. £400 out of pocket. In the end I used INPA and it was the solenoid switch that opens the valve from the fuel tank into the charcoal canister that collects the fumes. £10 off ebay. 10 mins to fit and they had it for a week. When you take it to a specialist with all the expensivediagnostic gear you'd expect them to find it. They just change parts these days until it works, bit like gas engineers change every part until your boiler works and charge you for it. Shame I didnt see your post before you went. Couldn't wait, had to fill up on the way back from work from a Shell garage ( no Shell, BP or Texaco where I live), still had just under a qtr tank of the old fuel, so a little bit watered down, but it's getting there, the pinking hasn't completely gone yet, but I am confident that on the next fill up, it will. I just assumed Esso "synergy" (I think that what it's called) was a high octane petrol, and the only other petrol available in Tiverton is either Jet,Tesco ( not "99") or Morrisons supermarket fuel. I'm on my 3rd tank of either Shell or Texaco petrol now...it's a lot better, but not perfect. If I keep the roof and windows up, it's great!...can't hear anything except all the "good" sounds the engine makes...window down, very faint pinking occasionally. Going to try some octane booster as a last resort, but to be honest, I'm happy now as it is. I am convinced the issue was all down to using Esso "Synergy" fuel...I have been filling up with Shell and Texaco, and all ok, last night I was caught short, so I had to use Morrison's petrol, and all ok?...so I think it was just the Esso petrol that my car doesn't like.